Bathrooms can be hazardous to your health–the statistics prove it. Every year, according to the Centers for Disease Control and Prevention, about 235,000 people over the age of 15 come to emergency rooms with injuries that happened in the bathroom, and 14% of them, almost 33,000 people, are hospitalized. Injuries increase with age, and for all ages, the most accident-prone activities were bathing, showering, and getting out of the tub or shower. By applying Better Living Designs and products we can reduce the potential hazards we see in most bathrooms. Consumers don’t have to forego aesthetics for products that address some of the sensory losses and decreased mobility often attendant on aging. Considering that 90% of Americans age 50 and older say that they prefer to stay in their homes as they grow older, according to AARP. Three of the largest trends in Better Living Designs are No-threshold showers, taller toilets, and layered lighting to eliminate glare. These features provides a level of safety for all ages. 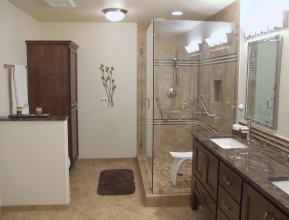 No-threshold showers are becoming common place in remodeling as well as new home builders. No-threshold showers are a benefit for everyone, not just for those who have mobility issues. This type shower use a trench style or linear drain rather than a central drain, that means the shower floor only need slope in one direction rather than two, which also makes it possible to use larger tiles on the floor, opening up greater design opportunities. In the shower, flip-up seats, grab bars, and hand-held shower heads on a vertical slider are other conveniences that serve people with a range of abilities. A seat offers a place to rest or a safer way to trim toenails or shave legs than trying to perform those tasks while leaning against a shower wall or bending down with one foot propped up on the shower curb. While grab bars have the connotation of being for old people, they don’t have to look institutional. There are manufacturers now making grab bars that are not only functional but pleasing to the eye. Preparing for future grab bars starts with the design and layout. Planning and installing all the necessary blocking in the walls behind the tile is essential, even if the grab bars are to be installed at a later date. Providing adequate lighting benefits everyone, but especially those in the 40-plus age range, since it’s around age 40 that people begin to notice the diminution in vision that aging brings. At age 60, people need three times the amount of light as they did at age 20. We recommend some type of natural lighting, either from windows, skylights of Solar tube. Where people are performing tasks such as shaving, putting on makeup, and taking medications, a mix of task lighting and soft overhead lighting can eliminate glare and make it easy to accomplish those tasks. Motion sensor lighting works well and does not require fine motor control needed to operate other types of switches. By using Better Living Design concepts and products in a bathroom will not only create a convenient and beautiful space for homeowners to age in place, but will also make their homes welcoming and safe for visitors of all ages and abilities. Employing universal design concepts and products in a bathroom will not only create a convenient and beautiful space for homeowners to age in place, but will also make their homes welcoming and safe for visitors of all ages and abilities.